Welcome to our review of the Bushnell ImageView 15-45×70 5MP Camera Spotting Scope. This is a unique product in that it is a spotting scope and camera in a single unit. There are definitely other ways to get your digital camera to work alongside your spotting scope, but those involve owning a higher end spotting scope that accepts T-ring adapters, getting the right T-ring adapter, and owning a digital SLR camera in the first place. I was encouraged to see this all-in-one option, and I was eager to test it out. Let’s see if the ImageView lives up to the hype. The objective lens is a decent 70mm in diameter, which should allow for a good amount of light transmision, and the spotting scope includes an angled eyepiece for comfortable viewing. The eye relief through the eyecups, however, is quite disappointing at just 11mm. You practically have to shove your eyeball into the eyecups to see the image. The ImageView is 11.6 inches long, and weighs in at a mere 1.6 pounds. The accessories are mostly nice, but the included tripod is very flimsy and shaky. I recommend purchasing a better one, particularly if you’ll be using the spotting scope in the wild. 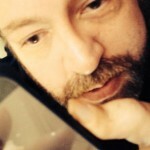 What’s the Magnification of the ImageView? Here is where things get confusing. While Bushnell has developed the ImageView to have a synchronized light path for the image, the actual magnification of the image is different for the camera than the eyepiece. Through the eyepiece, you can adjust magnification from 15X to 45X, but the camera’s maximum zoom is 22X. During my testing of the ImageView, I didn’t notice much chromatic aberration, but there was some blue fringing through the eyepiece and the camera. This can be corrected in images somewhat through post-processing, but you shouldn’t have to do that. You’ll notice a healthy 121.5-foot field of view at 1,000 yards at 15X, but a quite slim 17.5-foot viewable area at 45X. How Easy is the Scope to Use? 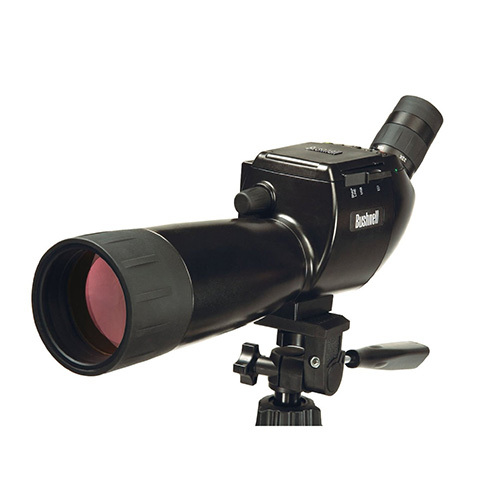 As a spotting scope alone, the ImageView is relatively easy to use. The focus and magnification controls are where you’d expect them to be, and both are sized and knurled properly for use with or without gloves. Where things get confusing is when you try to take pictures. You see, you have to flip a switch to send the view between the eyepiece and the camera, and if you forget to flip that switch or depress the shutter button too quickly, you’ll end up with a blank picture. How Well Does This Spotting Scope Gather Light? How Are the Optics and Focus on The ImageView? Bushnell made a major mistake in this spotting scope, in my opinion. The company chose to use inferior Bk-7 prisms instead of BaK-4. With that said, I haven’t noticed any phase shift, so at least the prisms are properly treated with phase correction coating. The focus is decent, but it can be a challenge to get everything properly focused when you switch from the eyepiece to the camera view. You have to refocus your image when you switch back and forth. What’s the Housing Like on Bushnell’s Camera Spotting Scope? The housing is plastic-coated, and doesn’t have any texturing to it to make it easier to hold onto if you aren’t using a tripod. For this reason, I wouldn’t recommend using the scope as a handheld optics. It also feels like fairly cheap plastic, so it might not stand up to much of a beating. This particular spotting scope is not very durable at all. My first clue was the short two-year limited warranty, when most of Bushnell’s products are covered by a lifetime warranty. This model is neither fogproof nor waterproof, as the lenses are not O-ring sealed and the optics chamber has not been nitrogen-purged. How’s the Camera on the ImageView? As I’ve previously stated, controlling the camera can be a bit confusing. You have to switch between eyepiece and camera, and then refocus your image. Zoom is also independent between the eyepiece and the camera, so you’ll have to adjust the magnification again when you switch. Then there’s the aforementioned white balance issue, which makes for a difficult time getting a good quality image in the bush. Next, the battery life can be measured in minutes; you’ll be fortunate to get more than a handful of pictures out of a single set of AA batteries. Finally, this is a mere 5MP camera, whereas I would have liked to see a beefier image processor in the optic. Thanks for reading my review of the Bushnell ImageView 15-45x70 5MP Camera Spotting Scope. This is one of a kind, pretty much, and it fails to impress. You’re better off investing in a quality spotting scope and DSLR camera, along with the appropriate accessories to pair the two together.